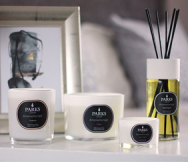 Set the mood with fruity camomile, delicate violet & soft orris. The combination of sweet honey and the sumptuous glow of coloured light creates the perfect atmosphere for your home. "Set the mood with fruity camomile, delicate violet & soft orris. The combination of sweet honey and the sumptuous glow of coloured light creates the perfect atmosphere for your home."